I’m going to clear things up a little. A lot of pre-made nootropic stacks are hitting the market nowadays. They all pretend to be the best formulation combining every substance you’ll ever need. I don’t think that these products are as complete as they claim, there are still some missing nootropics on their ingredient lists that can do a a lot for your brain. Nonetheless, these stacks cover a lot of the basics of cognitive enhancement and are surely a huge step ahead for newbies. 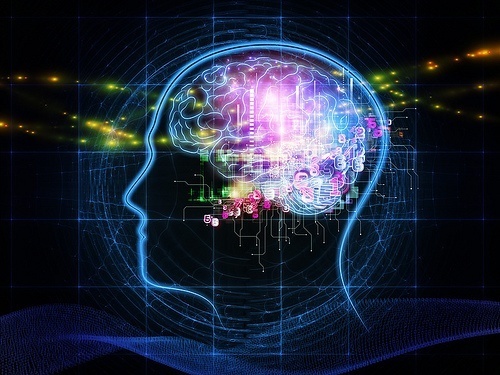 In another article I’ve pointed out the pillars of typical cognitive enhancement, we’ll see step by step how they are implemented in two popular ready prepared nootropic stacks: “Alpha Brain” and “Brain Stack“. Both the products contain Alpha-GPC, a powerful choline source that easily reaches the brain: 100 mg for Alpha Brain and 175 mg for Brain Stack. We also see Huperzin A in both the ingredients lists. Brain stack contains 150 mcg of Huperzin A, while Alpha brain contains 40 mg of Huperzia Serrata. Huperzia serrata contains 0.5% of Huperzin A, that is 200 mcg per serving. They also both contain vitamin B6, 10 mg in Alpha Brain and 15 mg in Brain stack. Brain stack also contains 300 mg of ALCAR, an additional help to increase the production of acetylcholine, and 100 mcg of vitamin B12. ALCAR increases the production of acetylcholine. Huperzin A is an acetylcholinesterase inhibitor, it slows the destruction of acetylcholine. Alpha-GPC is a one of the best sources of choline, a precursor of acetylcholine. Vitamins B6 and B12 are cofactors in the acetylcholine synthesis (Their deficiency brings cognitive decline. Read my article and this research). The cholinergic portion of the two stacks. In this very field, Brain Stack wins the battle. It has more choline and cofactors, a good dose of ALCAR and only score less in the Huperzin A department, by only 50 mcg, not a big difference. Along with acetylcholine, these stacks intend to boost other neurotransmitters as well. Dopamine cannot be directly supplemented, you can only use a precursor. L-Tyrosine and L-Dopa are the two most popular dopamine precursors. Alpha Brain contains 300 mg of L-Tyrosine. Brain Stack contains 200 mg of Mucuna Pruriens, a source of L-Dopa. extra dopamine improves mood and counters depression and anxiety. L-Theanine is there for the same goal, 120 mg in Brain Stack and 200 mg in Alpha Brain. Naturally found in tea, it increases both dopamine and GABA activity, it has a mild anxiolytic effect perfect to counteract the side effects of stimulants like caffeine. Phosphatidylserine also increases dopamine (PS is actually involved in the activity of many neurotransmitters, not only dopamine). This one is contained in Alpha Brain only. 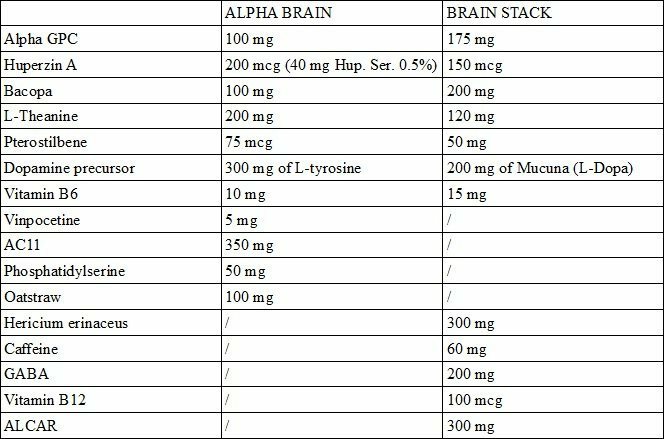 The table shows that Brain Stack also contains some GABA, but this is unfortunately useless, GABA doesn’t reach the brain, it must be supplemented indirectly. In the field of mood enhancing the victory goes to Alpha Brain, because of its higher dose of L-Theanine and the presence of Phosphatidylserine. Brain Stack contains 60 mg of caffeine, more or less the equivalent of one coffee cup. Alpha Brain contains no caffeine. This choice has its pro and cons, Alpha Brain lacks a proper stimulant, but this detail fits perfectly the need to make Alpha Brain a supplement suitable for both the day and the night. It’s not suggested to take Brain Stack in the evening because of its caffeine content, while Alpha Brain is used to optimize sleep too. 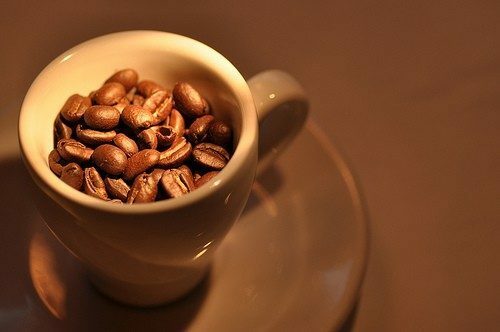 And if you need caffeine, you can easily drink some coffee or tea without having it in your pills, don’t you? Alpha Brain contains 5 mg of Vinpocetine per serving, which is a very low dose. Vinpocetine increases blood flow to the brain: it’s a cerebral vasodilator. I believe that Vinpocetine is only useful for old or diseased people ( really useful in case of reduced circulation in the brain! ), it’s not a nootropic that a young healthy individual would benefit from, but the dose in Alpha Brain is so low (5 mg per 2 pills) that it won’t do any harm either. Brain Stack doesn’t contain Vinpocetine for now but it seems like it will be part of their new formula. Both Alpha Brain and Brain Stack contain pterostilbene, a powerful anti-oxidant related to resveratrol. Resveratrol (naturally present in red wine in very small quantities) has been hyped a lot while pterostilbene hasn’t been much popular yet, even if the results of research increasingly point at it as a better alternative. Pterostilbene is found in blueberries and it’s one of the reasons they are so healthy for brain function. 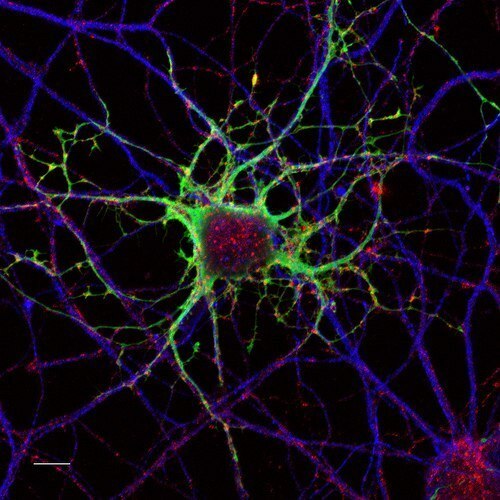 It seems like pterostilbene slows the aging of the brain protecting the neurons from damage. Although both stacks contain pterostilbene, the dose in Brain Stack is a lot higher. Bacopa is a powerful learning agent, research shows that bacopa drastically lowers the time needed to learn a new task. Bacopa works on both the cholinergic and GABAergic activity (focus and stress relief) and is probably one of the biggest contributors of the overall effect of these stacks we are examining. Alpha brain contains 100 mg of bacopa while Brain Stack has 200 mg. This one is contained only in Brain Stack (300 mg) and is one of its peculiarities. It’s a fungus and his extract is neuroprotective and boosts immune function. Lion’s Mane stimulates the production of neurotrophins NGF and BDNF. It has been proven to reverse brain damage in cognitive impaired people. This is one of Brain Stack‘s strengths. AC11 is a patented Cat’s Claw extract of Onnit, the producer of Alpha Brain, it’s not contained in any other nootropic. It’s one of the most important ingredients of Alpha Brain (it has 350 mg of it). It’s more of a immune system booster than a cognitive enhancer, they also claim that it’s able to repair DNA, but not a lot of research has been done yet to prove it, so we can’t really know its effectiveness, however it’s a very powerful anti-oxidant. Brain Stack has a stronger cholinergic activity than Alpha Brain. Alpha Brain is a more powerful mood enhancer than Brain Stack. Both Alpha Brain and Brain Stack also contain a natural nootropic with immune function benefits: respectively Uncaria Tomentosa (AC11) and Hericium erinaceus. They both contain Bacopa, but Brain Stack has twice the dosage of Alpha Brain. From this data, I conclude that Brain Stack is more powerful than Alpha Brain for the sole cognitive enhancement and stimulation purpose. Alpha Brain by the way, looks like a good overall stack with a lot of benefits to mood. The two stacks are really similar but the different dosages can lead more to one or the other side of the spectrum (stimulation vs mood enhancement). What’s your experience with Alpha Brain and Brain Stack? Let me know in the comments below.